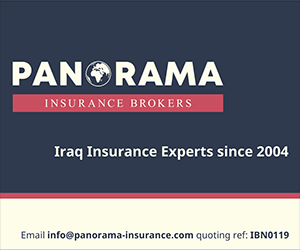 In December 2017, Iraqi authorities announced that they had completely freed areas previously controlled by the Daesh terrorist organization. Today, Iraq has entered a crucial phase of national reconciliation, stabilization and reconstruction of freed regions. These actions are essential for a lasting victory against terrorism and the return of displaced persons. France and its partners have continued their efforts, and are standing alongside the Iraqi people and Government in order to assist the most vulnerable populations, revitalize the economy and rebuild the country. For example, multi-sectoral emergency assistance (food aid, basic healthcare and essential goods) was provided to almost 200,000 displaced persons during the battle of Mosul. 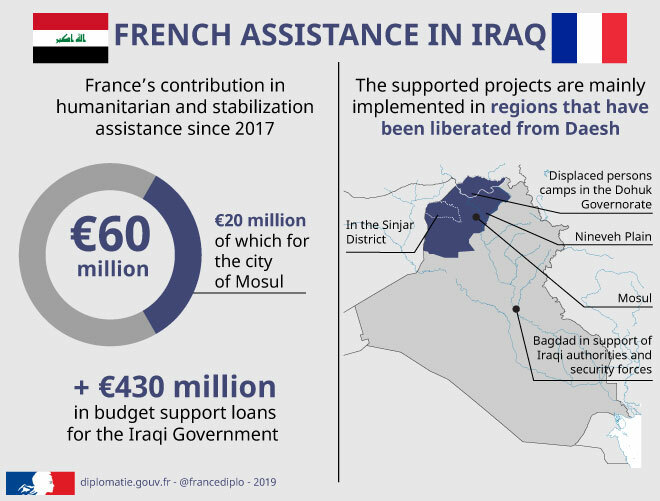 Since 2017, France has dedicated €60 million to humanitarian and stabilization assistance activities in Iraq, including €20 million to the stabilization of the city of Mosul. During a visit to Iraq on 26 August 2017, the Minister for Europe and Foreign Affairs, Jean-Yves Le Drian, and the Minister for the Armed Forces, Florence Parly, also confirmed that a budgetary loan of €430 million would be granted to the Iraqi Government. In addition, France runs humanitarian and stabilization assistance activities through United Nations agencies such as the UN Refugee Agency (UNHCR) and the World Food Programme (WFP). It has contributed €7 million to tools developed by the United Nations Development Programme (UNDP) in Iraq. Restoring security is essential to ensure that displaced people can return voluntarily to regions freed from Daesh control. As part of the Global Coalition Against Daesh, France is providing military support to local forces working to secure recently freed Iraqi regions, in order to prevent the resurgence of the Daesh terrorist movement. France is also helping to train Iraq’s internal security forces in the fields of democratic crowd management, mine clearance (including chemical and underwater mines), and post-attack scene management. In the projects supported by France, special emphasis is placed on the health of Iraqi people. In addition to contributing emergency humanitarian assistance, France has implemented programmes to support health infrastructure (hospitals, health centres in camps and mobile clinics) and provide psychological treatment to populations, who are often traumatized. France is also strongly committed to rehabilitating the University of Mosul’s College of Medicine, which trains medical staff throughout the Nineveh Plains and beyond. The College was badly damaged during fighting. Today, as a result of France’s commitment and UNDP support, it has been completely rebuilt. It has welcomed a number of students since the start of the 2018 academic year. Education is a priority of France’s assistance. In addition to supporting the University of Mosul, France has committed to programmes rehabilitating schools in the most hard-to-access areas. It has financed informal educational support projects for children who had no access to education during the Daesh occupation, with a view to reintegrating them into Iraq’s public school system. Child protection training and campaigns raising awareness of children’s rights have also been implemented by NGOs. A united Iraq, where all components of society are respected, is essential to ensure that the stabilization process is inclusive and has lasting results. The country must not only focus on physical reconstruction, but also on reconciliation. France therefore pays special attention to the victims of ethnic and religious violence. A special fund finances projects led by NGOs aiming to respond specifically to the needs of these communities and to encourage their return to their home villages, towns and cities. At the Paris Peace Forum in November 2018, the French President lent his support to Nadia Murad, Nobel Peace Prize winner in 2018, who has launched a fund to rebuild Iraq’s Sinjar region, which suffered heavily under Daesh. France will contribute €2 million to this fund, which will be used to build infrastructure such as schools and hospitals, create revenue-generating structures, foster the return of displaced Yazidi populations to their lands, among other activities. The ties between France and Iraq when it comes to preserving cultural heritage and archaeology are long-standing. Three priorities have been identified in recent years in coordination with local authorities: combating trafficking, protecting works and safeguarding the memory of sites. Several training activities for Iraqi heritage preservation professionals have been planned in partnership with the Institut National du Patrimoine (INP) and the Department of Near Eastern Antiquities at the Louvre Museum to improve techniques to combat the trafficking of cultural goods and artefacts. The Institut Français du Proche-Orient (IFPO) in Iraq, which has a branch in Erbil, has established cooperation with academic institutions in the areas of archaeology and cultural heritage. In 2018, the Institut Français de Recherche à l’Étranger (IFRE) conducted several digitization and preservation projects on Iraqi sites with funds from the International Alliance for the Protection of Heritage in Conflict Areas (ALIPH). France is committed to fighting impunity for crimes committed in Iraq and has taken every opportunity to make progress on this issue, particularly in the Security Council and other UN bodies. 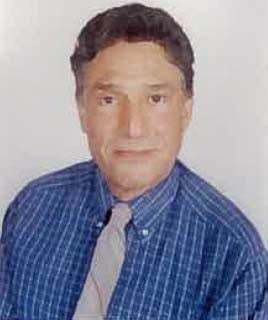 It is funding projects to document the crimes committed to provide information for investigations. Training activities to improve the skills of Iraqi law enforcement authorities are also being conducted to make criminal prosecutions more effective. Eric Chevallier, Director of the Ministry’s Crisis and Support Centre, explains France’s action to support the country’s stabilisation and reconstruction, and the humanitarian aid that we are providing.